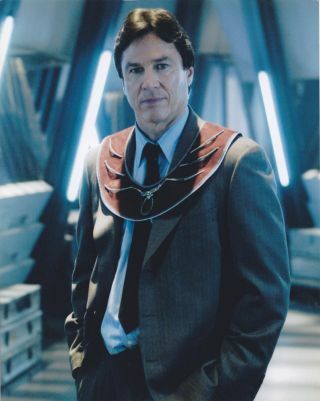 Actor Richard Hatch played Tom Zarek, a prisoner-turned-politician, in the reimagined "Galactica" series of 2005-09. OTTAWA, ONTARIO — Moments into my 45-minute long Skype chat with Richard Hatch on April 2, the science fiction television star proudly gestured to the wall behind him in his Los Angeles-area home. A huge poster of a "Star Trek" federation starship hung above the bed. Then he pointed over my shoulder. "I love that astronaut picture!" he said, referring to a large picture of Buzz Aldrin I have in my office. Turns out that Hatch — who has played astronauts on television — is a huge fan of the real ones. Now Hatch is finally getting the chance to participate in the franchise for himself. He will play a Klingon commander, Kharn, in the forthcoming fan-made film, "Star Trek: Prelude to Axanar," which warped far past its original $10,000 Kickstarter crowd-funding goal to raise about $101,000. "It ['Star Trek'] always had hope. It was always about something better," Hatch told Space.com. "It was always about finding solutions, and it just was one of those things, I think. I don't know how anybody can look to the sky and not wonder what’s out there, and here you have a show where no man or woman, literally, has gone before." Actor Richard Hatch portrayed Captain Apollo in the original version of "Battlestar Galactica," which ran from 1978-9. Space has been a recurring theme throughout Hatch's career. He is perhaps best known in science fiction for playing Captain Apollo in the original "Battlestar Galactica" from 1978 to 1979. He enjoyed the series so much that he wrote stories about it — and campaigned for it to return to the air — for three decades. When a reimagined series finally aired between 2004 and 2009, Hatch took a part as Tom Zarek, a prisoner-turned-politician whose revolutionary ideas made the military nervous. Hatch is also the creator of "The Great War of Magellan," a space opera that Hatch describes as a sci-fantasy series spanning thousands of years, a sort of "Lord of the Rings" in space. This spun off several trailers (that Hatch starred in), graphic novels, a role-playing game and a forthcoming novel trilogy. Even in his spare time, Hatch meets astronauts in real life. He's a regular attendee at SpaceFest, an annual show in Pasadena, California, that brings astronauts and space fans together for autographs and other activities. "I hang out and have dinner with the guys who walked on the moon," Hatch said with a smile. "When they introduced me … I was cringing," Hatch said. "I thought no one was going to remember me. But there was this big clapping, shouting, this kind of acknowledgment, and I thought, 'People doremember.'" As fans came to talk to him that day, Hatch learned that science-fiction franchises can cross boundaries. "I realized a lot of the 'Star Trek' fans are 'Battlestar' fans, and many 'Battlestar' fans are 'Star Trek' fans, as much as people are loyalists." Hatch repeatedly said he can't believe there are no new fiction television series on the air right now depicting space exploration. "It's a phenomenal genre that is under-served." This is where he thinks "Axanar" can make a difference. The production has heavy participation from "Star Trek" veterans such as actor Gary Graham (Vulcan ambassador Soval on "Star Trek: Enterprise") and several production staff. Hatch, who has watched several "Star Trek"fan projects through the years, added that "Axanar"has the highest production value of fan films to date — something that elevates it to the indie genre. Hatch is so enthusiastic that he's hosting rehearsals as a part of the acting classes he teaches. CBS and Paramount are generous in allowing "Star Trek" fan shows to go ahead as long as the participants collect no profit, Hatch said. He's trying to negotiate a similar arrangement for a "Battlestar Galactica" spinoff fan series. Hatch's ultimate hope, however, is that fans will find the courage to make unique science fiction series that don't require studio negotiations at all. This would fill the space programming gap. And he's a big believer of Kickstarter campaigns in general, having been involved in fan-backed productions such as "Cowboys and Engines" and "After The Harvest." "Ultimately, these indie shows, I think, are going to stimulate these actors performing to start writing their own shows," Hatch said. "They will have the expertise they need to write their own shows and build up a loyal fan base. They can create original programming, it can start to go out there, and finally serve that community." Actor Richard Hatch in the space opera "The Great War of Magellan," which he created, directed and starred in. Hatch was coy when asked about "Axanar's" plot and Kharn's personality — he has spoiler fear — but said the part of the story that really attracts him is how well Kharn stands up to protagonist (and Starfleet captain) Garth of Izar. The movie follows the Battle of Axanar, which took place about 21 years before the original "Star Trek" series took place. The incident is referred to in the "Star Trek: The Original Series" third-season episode, "Whom Gods Destroy," but few details are provided. Kharn, Hatch added, is in awe of his foe because he sees that Starfleet is succeeding by blending different cultures together — something the Klingons historically were poor at. But the way the story is structured, it's a tossup as to who — Garth or Kharn — will win the battle, Hatch said. Hatch said the Klingons are much like the warrior tribe in the movie "300." These warriors are a group of people who use battle as a means to test their character. "Kharn almost welcomes the challenge," Hatch said, then slipped into character for a moment. "Come at me!" he shouted, sitting up and slapping his chest. "Show me what you have! Test me! I want to bring my best. Knock me down, and I will get back up again. 'It's really that warrior feeling of wanting to be the best I can be.'"